Shirts With Random Triangles: Indiana linebacker Josh Barajas flips 2015 commitment from Penn State to Notre Dame. Indiana linebacker Josh Barajas flips 2015 commitment from Penn State to Notre Dame. 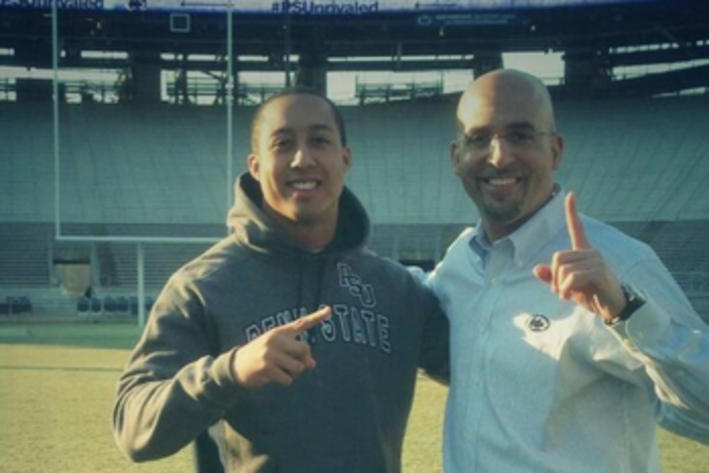 Josh Barajas with Penn State head coach James Franklin. Photo via Black Shoe Diaries. Notre Dame is having a "what's mine is mine, what's yours is mine" moment with Penn State. Merrillville, In. high school rising senior inside linebacker Josh Barajas has flipped his class of 2015 commitment from the Nittany Lions to the Fighting Irish. He had originally committed to Penn State in March. Barajas attends Andrean High School in Merrillville, He is graded as a four-star ILB by ESPN. The WWL ranks him as the ninth-best ILB in the US, and 283rd on the overall ESPN 300. Barajas is 6'3" and weights 210 lbs.